"Never Lose Hope" -- Many of us have lived through times of despair when it felt like enduring the seemingly impassable road ahead was unbearable. And yet, we come through it because of the unconditional love of the closest people around us and, of course, our pets! Desmond Tutu said, "Hope is being able to see that there is light despite all of the darkness." That light is the glimmer of truth that no matter how dire things look or how long healing takes, we have every reason to never lose hope. Listen to Rev. 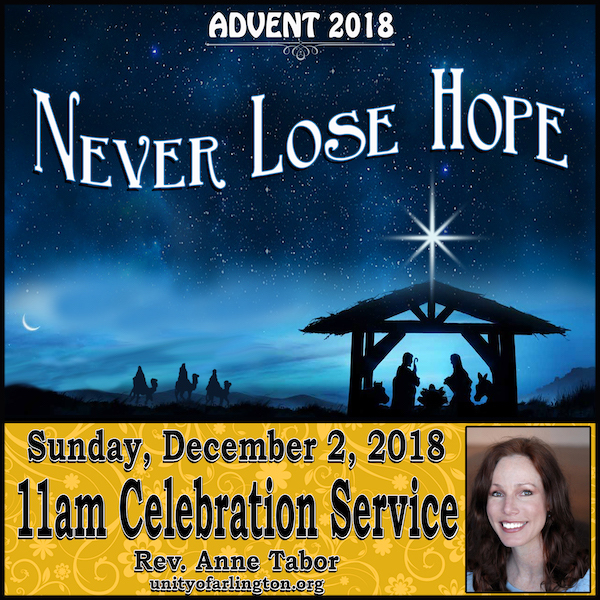 Anne, this first week of Advent, as we begin to prepare for the birth of the Christ within us all.